I put the "Vision" of Y.A.H.W.E.H in front of me always. In front of King God The Holy Be Blessed. Because your people are source of life - In Your Light will see Light. God will protect your coming and going from now and forever. "The LORD your God will bless you in all your work and in all your undertakings. "And I will remove sickness from your midst". of protection and praises in Hebrew. 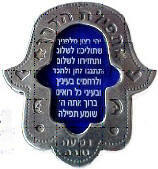 Place this "Shivita" - ("you put forth the "vision" - in Hebrew) in a prominent place in your home. There cannot be a greater reminder of God. An exceptional gift for you or for someone you care about. 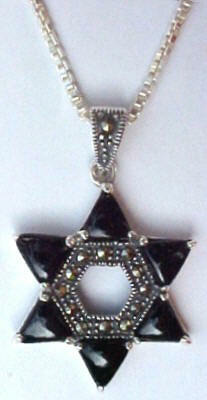 Display or hang this exquisite silver tone frame depicting Jerusalem in 3-D.
Let my right hand forget her skill! 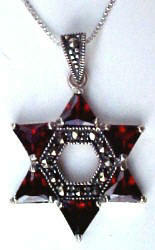 Engraved in Hebrew under the Star of David. The Western Wall and The Jewish Quarter. The back of the frame is lined with black velvet. Beautiful gift for Holidays, Weddings or New Home. Holy Temple Pillars in 3-D.
Grape vines and floral decor surround this prayer of "Blessings for the Home". The metallic tone frame is accentuated with relief biblical images. The back of the frame is lined with black velvet. Let no sadness come through this gate. let no trouble come to this dwelling. Let no fear come through this door. Let no conflict be in this place. let this home be filled with the blessing of joy and of peace. A gold CHAI (the symbol of "Life") is in the center of the "Eye"
with two fishes (symbols of prosperity). The Blue color and the "Eye" in the center of the Hand shields its owner from the curse of the evil eye. Attractively gift boxed with a description of the "History of the Hand". Ideal gift for new homeowners. Keep it in your home or give it as a good luck wish from the heart! Twelve Tribes of Israel with the tribes names. on how to make the Chest piece. Original gift everyone will love to receive! Suitable for a any occasion! This artistically designed Hand is crafted in the highest-grade pewter. Attractively gift boxed with a description of the "Stones" and their meaning. The "Hand" symbolizes the "Hand" of God; Always open and giving. Ideal gift for a new homeowner. of Israel with the tribes names. The "Hand" symbolizes the "Hand" of God; Always open and protecting. A Blessing for the home in front with lovely floral engraving. Attractively gift boxed with a description of the "Hand of God". 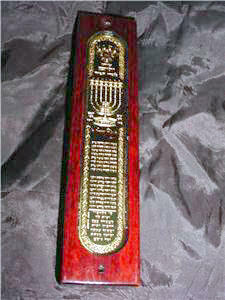 The Mezuzah signifies the sanctity and blessing of the home. 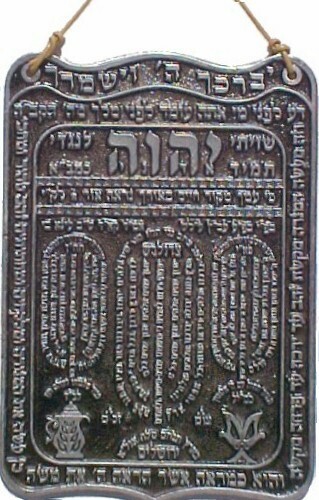 It is a portion of Holy Torah (The Old Testament) inscribed in the same manner. It is an "original" sanctified document in accord with laws and precepts that dare not be compromised. 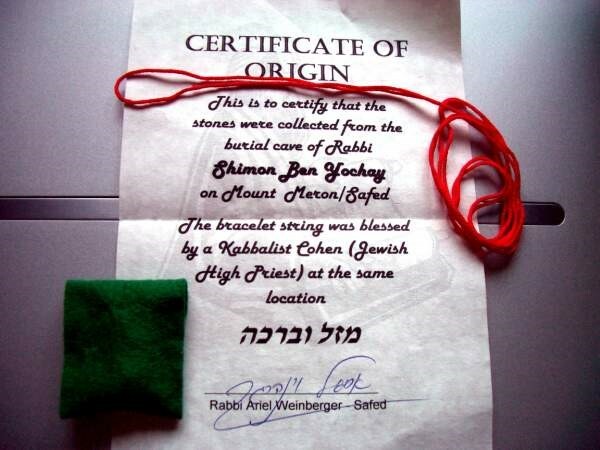 On this sacred scroll of parchment are inscribed two passages from the book of Deuteronomy. 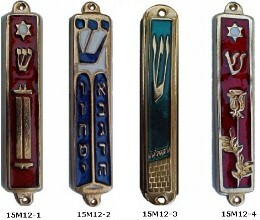 It is customary upon entering or leaving a residence to touch the mezuzah. the unity of God, the duty of loving and serving Him with our whole being and our obligation to observe the Mitzvoth (Deeds) in and out of the home. to visitors as well as to us. The Mezuzah sanctifies and protects the home, as well as fulfills the saying of the Psalmist, "God will guard your going and coming from now and for all time." Hand painted in vibrant enamel colors with the highest-grade pewter. Great gift for a new car - Excellent gift for a new driver! * Scroll is already inside the Car Mezuzah. Sizes about: 1.5" x 2"
These artistically designed Key-Chains portray the "Hand of God"
as well as other symbols of protection and good luck. 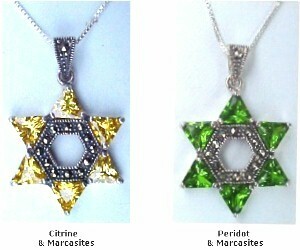 Hand painted with bright enamel colors. and protection everywhere you go! "May it Your will, God, our God and the God of our Forefathers that you lead us towards peace and You will save us from any enemy and ambusher on our way and from all kinds of retributions, and You will bring us to our destination in peace". Copyright © 2006 by New Thought Kabbalah All rights reserved. Revised: 09 Apr 2011 23:00:54 -0400 .